We transfer, copy and convert U-matic video tapes to DVD and any Editable File Formats, AVI and MP4 being the most popular. 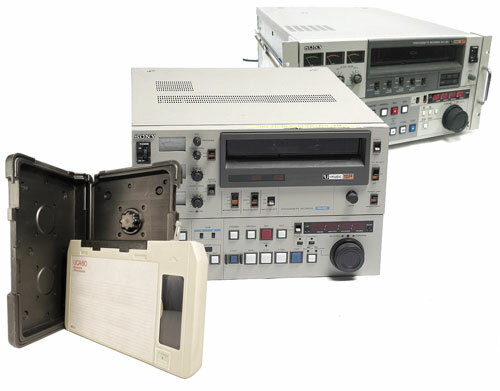 We have a fantastic collection of professional U-Matic player/recorders including a Sony BVU-950. The two High Band variants are known as BVU and BVU-SP (or U-Matic SP) respectively. The second one records and plays differently to the first and as such U-matic tapes recorded in BVU and BVU-SP formats cannot normally be played on Low Band decks. If the tape has snapped or become chewed up, mangled and creased send it to us! We can also repair or replace the outer cassette housing should the need arise. We convert NTSC or SECAM U-Matic tapes to PAL and vice versa. Umatic video tape transfer to computer editable AVI files and MP4 files for iPad and iPhone. Some of our customers require editable files from the Umatic tapes for editing on a PC or MAC. We normally supply uncompressed AVI files which can play on all computer systems. Editable file sizes can be very large so you may need to supply an external hard drive or large capacity USB stick. We can supply these at cost. U-Matic tapes can be up to being 60 minutes long. We charge £40 for a single tape regardless of how long it is. You can choose between encoded DVDs for use on your TV system or digital files for computer editing. If you need help with editing, please contact us. If you give us 20 or more video tapes there is a 50% discount - just £20 per tape.